On Tuesday of this week, my patient daughter Amalia got up at the break of dawn (6:30ish in this part of the country), helped me catch 18 sleepy old hens and apologetically stuff them into crates, load them into the ‘Burb, and head for Brainard, Nebraska. She is an angel, but not without a condition: she agreed to go with me on my roadtrip, as long as I bought her a Dairy Queen blizzard later in the day. I willingly agreed to her terms, in order to have some company. Hauling my faithful old hens to their deaths is not my idea of fun times, and it’s unbearable to do it alone. Timothy dragged himself out of bed long enough to gallantly carry the crates full of old hens to the ‘Burb and load them. Then he headed back to bed. For once, Timothy got off easy. Bless him. Everybody in this part of the state who has chicken-butchering needs (those who don’t want to do it themselves–that would include me, of course) knows where Brainard is. I wasn’t sure exactly how to get there, but I had checked Google maps, and the way looked very simple–even for me–so off we went. 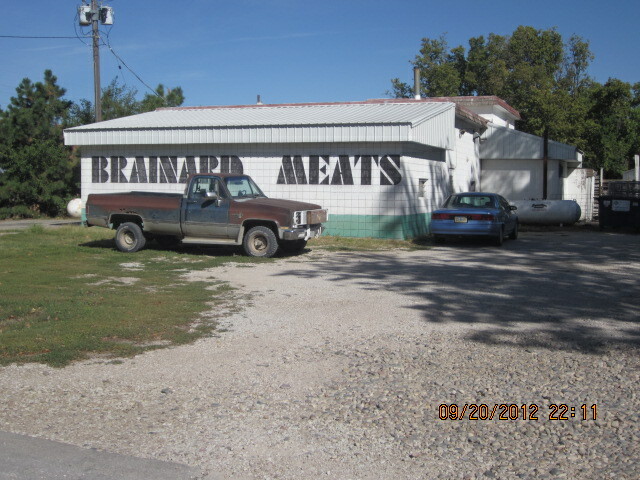 So I ask you–if Brainard, Nebraska is such a hub of chicken-butchering activity–why aren’t there more signs leading to this charming little town, nestled amidst rolling fields and pretty little hills, in the middle of southeastern Nebraska nowhere? Signs are rather important, generally speaking, aren’t they? 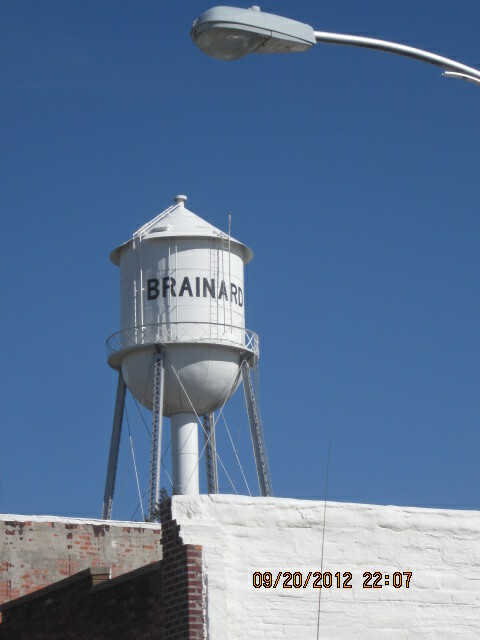 I have been a passenger with my dad driving to Brainard a few times before, but I had never driven there myself. So I got as far as the little green “Brainard 5 miles” sign, directing us to turn right onto a gravel road, and breathed a sigh of relief. I had found it. We were nearly there. I gave Amalia a high-five. I shouldn’t have relaxed. The sigh of relief was certainly premature. What was I doing, high-fiving before actually seeing the town itself? Never relax, people, until you are actually there. Never let down your guard. That’s what that little green sign should have said. But no. I suppose with the economy in a recession and tax dollars so tight and precious and la-dee-dah, they use as few words as possible on a sign, even if it means that well-meaning taxpayers (who, in fact, have paid for that sign, in essence, and therefore actually own it) might possibly . . . get lost because of it. Perhaps, fellow taxpayers, it’s high time for a nonviolent movement of some kind to increase the words of directional signage, especially in rural areas with very low population. Anyway. At the five-mile point, Amalia and I were chatting happily about all manners of things and . . . I missed the turn. I don’t obsessively watch the odometer like some tightly-wound, nervous types might. (Random note: I asked my husband how he figures out the way to Brainard, since there is no sign at that critical juncture. He looked at me as if I had just suddenly sprouted a twisted green horn out of my forehead. He opened his mouth and said “I–count–the–miles.” As if it’s that simple.) For my part, I admire the scenery. The gently rolling hills and the way the sun lights up the bean fields and turns them every shade of orange and green and yellow. The odd vulture, riding the thermals above us. I’m carpe-dieming the heck out of this road trip! I’m a student of life, and as such can’t be bothered overmuch by tiny numbers turning on a dial, dogginit! So. I soared right past that (non-marked) turn. The (blind) turn to Brainard. The (signless) turn that I didn’t know I had to take, since I was trusting signage and my recollection of a Google maps image, and didn’t have a map with me, and didn’t watch my odometer. (Lesson learned. Always have a map with you. Always, always, always. Even if you have a GPS and a vague memory of a Google map image.) We didn’t go many more miles before I started sweating. Not swearing, gentle reader. You read that wrong. Sweating. Perspiring, stressing, mild panicking. Amalia patted my arm. “Don’t worry, Mom,” she said. “Don’t worry. We’ll find it.” She smiled comfortingly. As sweet as she was, she had no suggestions for me on how to find it. Meanwhile, I kept driving up and down the picturesque hills on the minimum maintenance roads, trying to take my daughter’s advice and not worry. I couldn’t help but notice that there were absolutely no signs. Anywhere. “This is fun,” Amalia noted. “Kind of like a roller coaster.” I glanced down at the fuel gauge. Nearly a quarter tank, only. Why didn’t I fill up before we left? I heard a chicken let out a squawk in the back seat. Oh yeah. That was why: I had been too preoccupied with those silly chickens, and how sad I felt about sending them to the ax. Dumb chickens. They get me into so much trouble, really. Maybe my chicken-raising days were meant to be over. If I had a quarter for every time I’ve run out to the chicken coop in a panic, thinking something was killing the chickens by the noise they were making, I’d be a very wealthy woman, indeed. I could tell you stories . . . well, actually, I probably will, in the months to come, so I’d better not spoil any endings. Maybe this was a sign, I was thinking. 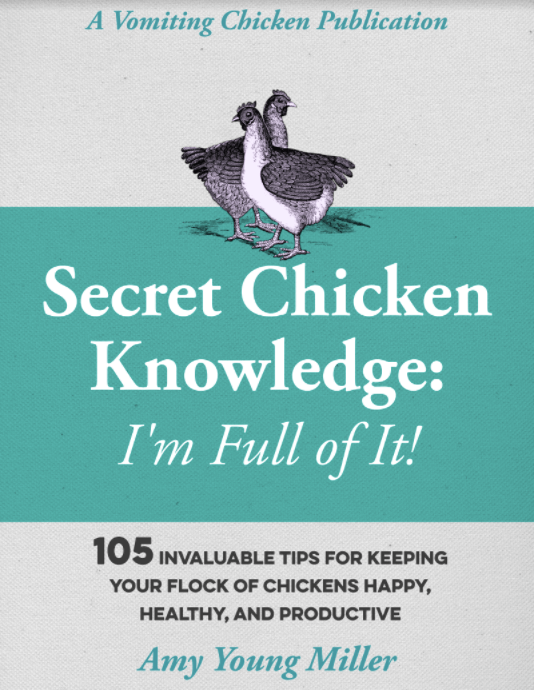 A sign that chickens were just–too–much–trouble. At least there was a sign, in this case. Just then I saw a lady who, I hoped, could be our benefactress: an old lady with jet black hair, freshly done, in a big red pick-up, slowing down to take a turn. I stopped our vehicle and waved her down. She stopped and rolled down her window. 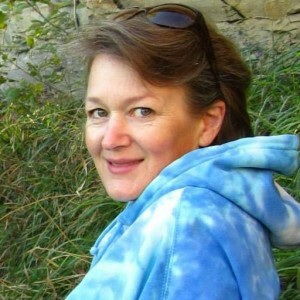 I admired her freshly-coiffed hair, painfully aware of the fact that I had flailed about in the chicken coop earlier, with my bed-hair, to catch 18 chickens, hadn’t showered afterwards, and wouldn’t be surprised to find a smear of chicken manure on my cheek. 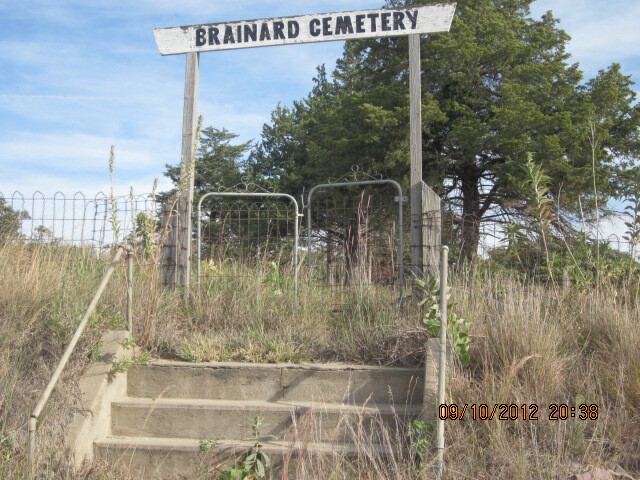 “Could you tell me how to get to Brainard?” I asked, painfully. She grinned, thought a moment, and then gave me directions that sounded a bit like this: “Go back the way you came, and then swing past the lakeandturnrightandthenturnleftandthenalittlefarther . . thenpastthecemeteries and . . andyou’llseegrainbinsand . . . you’re nearly there. You’ll see it. You can’t miss it.” I asked her to repeat her directions, twice, and then I thanked her, hoping that Amalia caught the bits that I didn’t. First of all: I have “missed it” enough times to never ever believe that phrase “You can’t miss it.” I can easily miss it, and usually do. But Amalia and I pieced together her directions and we did find Brainard, after all, and we were only a few minutes late for our chicken drop-off time, at that. The congenial guy at the meat processing place grinned broadly when I apologized for our tardiness. “We took a wrong turn,” I admitted. Or, well, actually, several. More precisely, we had missed a couple of turns. Due to your idiotic lack of signage out here in these hills! That’s what I wanted to say. But I retained my tense pleasantness and unloaded the crates of chickens. I had the feeling he had heard that before, anyway. He told me to come back in an hour and a half, and that he’d have our chickens ready for us. An hour and a half. That wasn’t very long. Amalia and I climbed back into the ‘Burb and drove off. My daughter and I had prepared for our waiting time. We both had a pile of books with us–I had my Bible and my journal and another book. I had figured we’d find a pretty place to sit and I’d catch up on my Bible reading, write a bit, and then start on the other book. Amalia had an ambitious pile of books, too: her math book, her history book, and another book she’s been slogging through apathetically, for school. I always overpack where books are concerned. She seems to, too. *gasp! 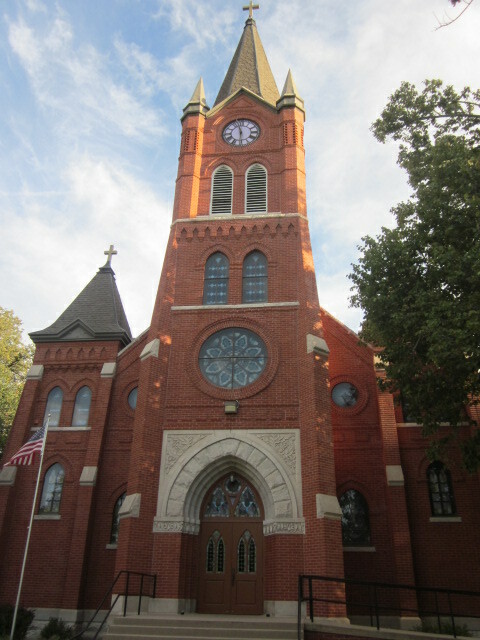 * The Holy Trinity Church in Brainard is a beautiful example of Gothic architecture, built in the late 1870s by the parishioners. By the parishioners! Isn’t it something? Isn’t it wonderful? I jumped out and took a few pictures, and then on a whim, went and tried the front door. Eureka! It was unlocked. Amalia wasn’t surprised when I tried the door, gave her the thumbs up, and then trotted quickly back to the ‘Burb and turned off the engine, pocketing my keys. “Let’s go take a look!” I said. “It’s amazing, isn’t it? I think it’s Gothic in design. Oh, I’m so glad I have my camera!” The responsibility of finding this little town and handing my old hens over now successfully over, I felt relieved and excited about the day again. “Really? Can we?” she said. She was clutching her math book. “I suppose you want to stay in here and do your math, instead,” I said. Her math book hit the floor before I could draw another breath, and my daughter was out the door and by my side. Not a one of my kids enjoy math, bless them. “It doesn’t have to be fun; it just has to be done.” That’s the Math Motto in our house. It’s not a popular motto. Twice I’ve traveled to Europe--once to work with missionaries in the Netherlands, and once to study art in Florence, Italy, as an art student. In the latter trip, we had studied about the art and architecture that we were going to explore for months before we went. We were knowledgeable and excited about what we were going to see. We spent lots of time in empty cathedrals, studying art and architectural details. There are so many old and amazing buildings over there. There are buildings still standing that were built before Christ was born! This astonishes me. Manufacturers can’t seem to make a toaster that can last for more than six months today. So how did those people, over two thousand years ago, build buildings that are still standing today? So many priceless frescoes, sculptures, and paintings are hidden away in those old basilicas. I got totally caught up in it. When all the rest of the kids of our group went off shopping during their free time, I went hunting for a new church to explore, usually with a few others who didn’t have spending money to burn. 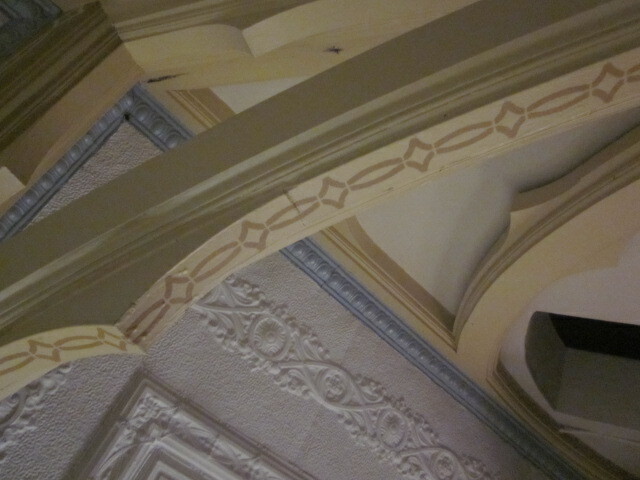 Exploring old buildings is almost always free, and is wonderful entertainment, especially if you’re an art student. When we came back home, it struck me as sad that I drove past beautiful old buildings every day without knowing what was inside them, though I had traveled all the way to Europe to peek inside old buildings there. The Pieta, one of my favorite sculptures of Michelangelo’s, is sitting in a dark corner of St. Peter’s Basilica in Vatican City, Italy. Don’t get me started on the Sistine Chapel ceiling. Please! Just go look at it for yourself. Or Google it. That was Michelangelo’s work, too, and it’s breathtakingly beautiful, especially if you realize that he was not a painter at all. He was a sculptor. Anyway. We opened the door. The inside of the church was beautiful, as you might have suspected by now. There was only one person inside, the priest, I assumed, sitting in a pew on the ground floor, quietly reading. Although we made a little noise (the clicking of our cameras, and gasps of delight, mostly) he politely ignored us. We climbed up a dark, narrow stairway into the balcony, and what we saw took our breath away. This building is a jewel. Wouldn’t you love to sit and look at this every Sunday morning? Look at the different shades of paint on the columns. Look at all the gold gilt. Admire that gorgeous shade of blue. I’m sorry this is not a better picture. This could be a wedding cake topper; it’s so pretty. And the colors! Just breathtaking. I Googled it when I got home: this building was built by the parishioners. Some parishioners! Don’t worry, I’m going to do some digging and find out about these guys. They weren’t your run-of-the-mill farmers and homesteaders, I’d imagine. Not that farmers and homesteaders are run-of-the-mill folks. But how did they design and create such a masterpiece, over a hundred and thirty years ago, in the middle of nowhere? Those parishioners had some pretty dandy building skills. And some very sophisticated artistic sensibilities, too, and I’m not sure which is more impressive. Oh, Amy–the art, my heart cries: the art is most impressive! 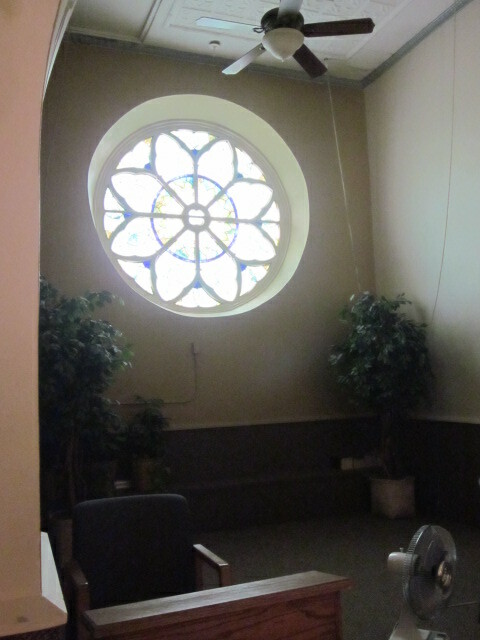 There’s a rose window in Brainard, Nebraska. What do you know. 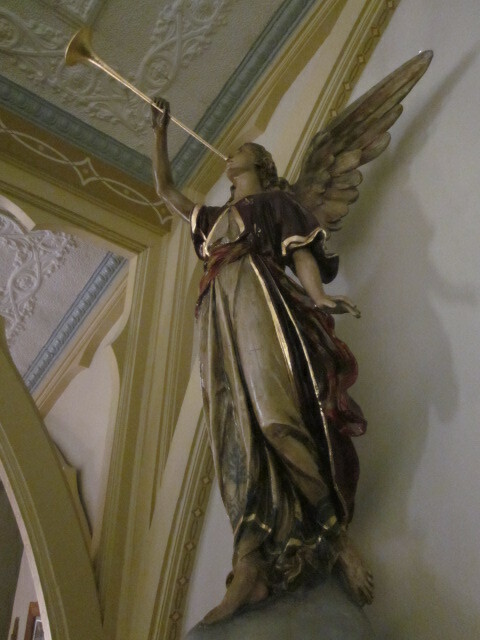 An angel keeping watch over the choir loft. Isn’t she pretty? Look at that gold detail. 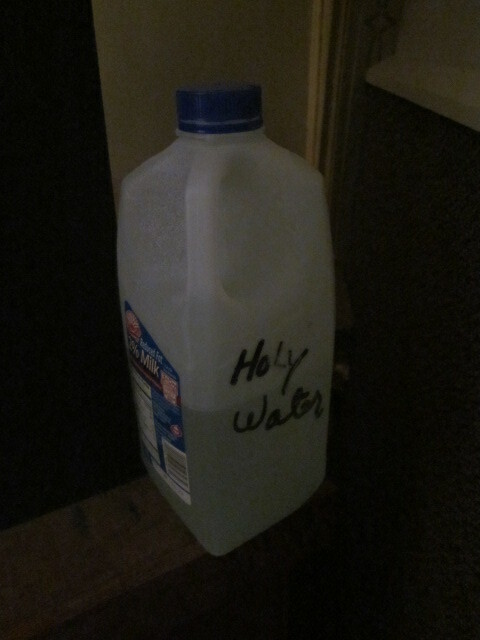 They aren’t too fussy about what they keep their “Holy Water” in. This I didn’t expect. I would have loved to have asked for a tour of the place, but decided to call ahead another time and get a tour when the tour guide wasn’t in the middle of his morning devotions. 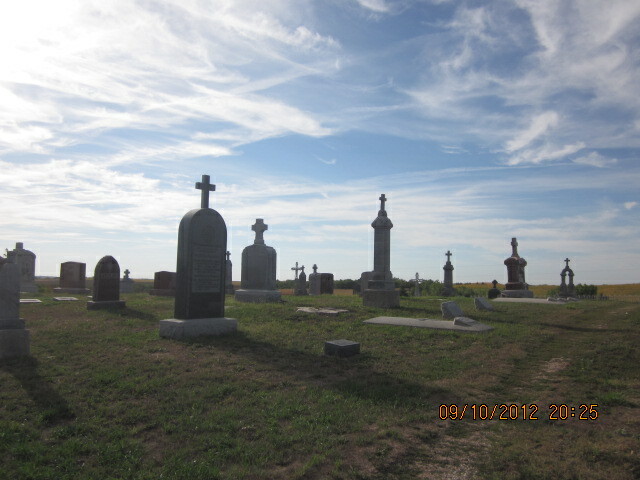 Apparently the Bohemians like their space, as this is a sparsely populated cemetery, so to speak. 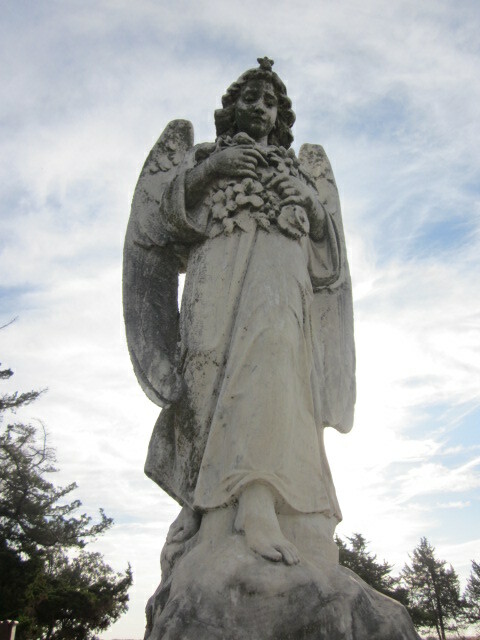 I thought this angel was quite beautiful. 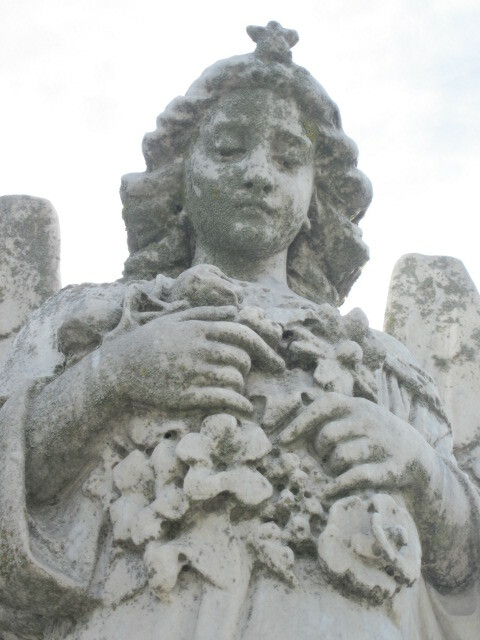 The third cemetery was a bit more modern, and this lovely angel was in it. Doesn’t she have the sweetest face? I loved the way all these crosses topping the stones looked against the beautiful morning sky. The fourth cemetery looked abandoned, but it’s not, really. 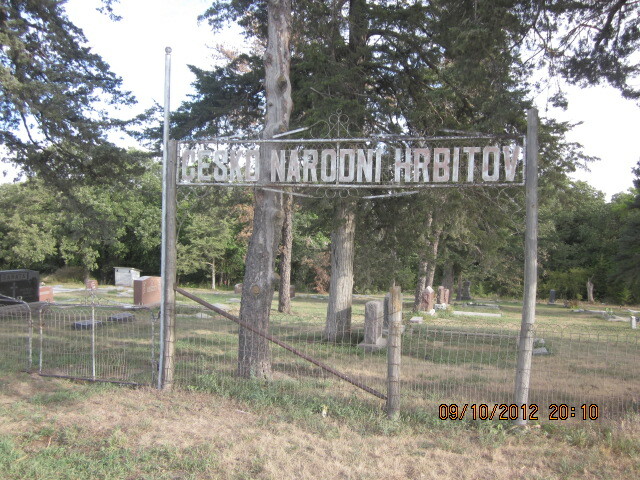 The gate to the fourth cemetery. The graves of little ones are always the saddest. Amalia discovered a well-protected guidebook, posted at the back entrance. It explained that the grass you see here is native prairie grass, so it is only mowed twice during the year: once the weekend before Memorial Day, and once in the fall, so the hay can be used as animal feed. The oldest gravestones are in this one. 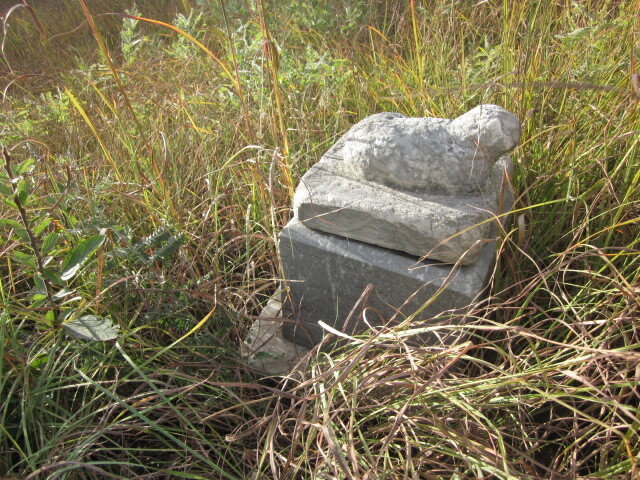 It is classified as an abandoned cemetery because there is no cemetery board, and no funds to apply to its upkeep. Sad. Ninety minutes were up before we knew it, and we had to scrap our original plan to catch a cup of coffee and a kolache at the cafe in town. We’ll do that when we make our return trip. Dad was, after all, near the ‘phone and I actually had my cell phone along, so he guided me back onto the right road and most of the way home. All this could have been avoided if there were more signs out there. Thanks for popping in, guys. Have a good one! Janelle, Thanks for going with me! I’m sorry that it was a little longish . . . I laughed out loud at “lakeandturnrightandthenturnleftandthenalittlefarther”. 🙂 Reading this reminded me so much of going traveling with Mom….she and I got lost coming back from Wahoo once, and ended up in Osceola (and had to buy a map there…a MAP!) 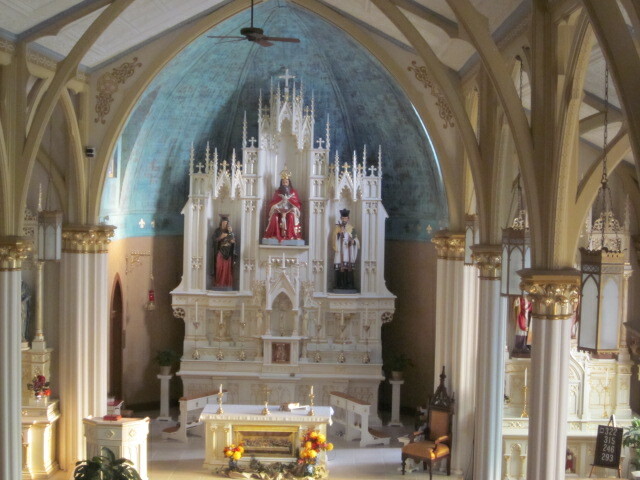 And yes, old Catholic churches are wonderful places to explore. Loved this!! Okay, Moll, okay, “I Yam What I Yam” (Popeye) I get lost very easily. I remember now that we were talking about Orange City with Dad and Mom, after our trip there. “That is a pretty town,” said Mom. Dad looked at her sharply. “You didn’t go with me when I went to pick up a car, Elna,” he said. “You’ve never been there.” Mom got a funny look on her face and said “Oh yes, I have.” I knew it had to have been on a trip up to MN. Impressed enough to go with me when I get a tour, Josh? Maybe they’d let you play the organ! What a wonderful trip! 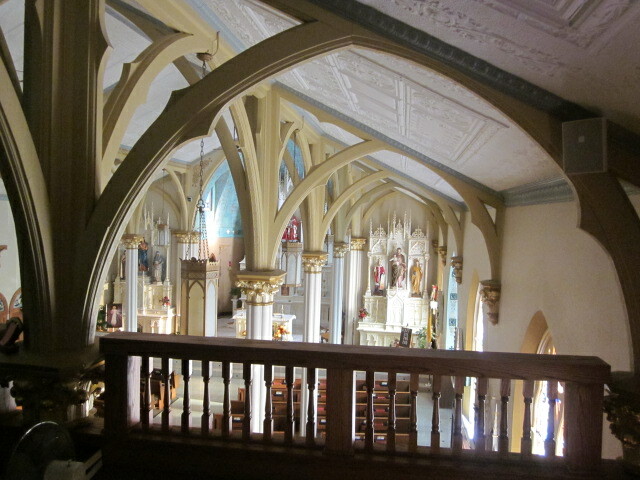 So fun to take us along and loved the Catholic church – gorgeous! Thanks Carrie–in fact, in a couple of weeks we’re going to return to Brainard and I plan to ask for a tour! Stay tuned . . . .